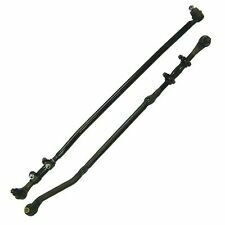 Rough Country Jeep Front Adjustable Track Bar 2.5-6" 07-16 JK Wrangler, Easy bolt-on installation Massive 1.25in outside diameter. Thick 0.28in wall tubing for heavy-duty durability. Heim Joint end offers a larger range of motion. Adjustable for proper fit. Perfectly center your Jeep's front axle., Fits models with 2.5 - 6in suspension lift kits. Models with 6in of suspension lift require track bar drop bracket (# 1118)., Includes - Front adjustable track bar Bushings Hardware. 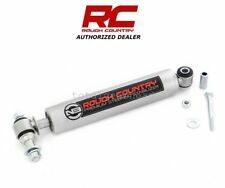 Replace your old worn out factory stabilizer with a new Rough Country Heavy Duty N2.0 Stabilizer. This stabilizer shock simply bolts into your factory mounting position. Steering stabilizers are designed to restrain "bump steering" and front end vibration, giving added life to your tires, ball joints and other steering components. 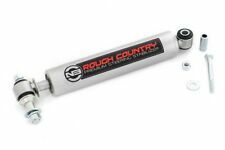 Rough Country Steering Stabilizer - 97-06 Jeep Wrangler TJ 4WD. Fits: 4-door JL Wranglers with 3.6L engines only. 2" Lift kit with Fox Shocks. 1992-1995 4WD Jeep Wrangler YJ. 1997-2006 4WD Jeep Wrangler TJ. We're confident in our high-quality products so we're giving you more peace of mind and more bang for your buck! We'll replace your defective item at no cost to you! 2x Front Shock Extenders. 2x Rear Shock Extenders. 3" Front and 3" Rear Lift Kit for 07-18 Jeep Wrangler JK. Fits Jeep Wrangler JK This kit will Raise the Front and rear of your wrangler JK 3". The best part about this kit is it is MADE IN THE USA! 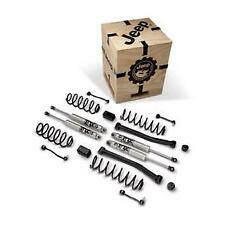 YOU ARE PURCHASING A FULL SET OF FOUR JEEP FACTORY OEM 2018 WRANGLER JL, RUBICON, SAHARA AND SPORT SHOCKS. THIS SET OF SHOCKS WERE REMOVED FROM A NEW 2018 JL RUBICON FOR LIFT KIT INSTALLATION. THEY ARE 99.9% LIKE NEW AND READY FOR INSTALLATION. Perfectly centers your Jeep's front axle. Adjustable for proper fit. Installation instructions. Tie rod end. Thick 0.25" wall tubing for heavy duty durability. Jeep Wrangler TJ. 1997-2006 Jeep Wrangler TJ. Front and Rear Extended Shocks. Takes about 2-4 Hours with hand tools. (This kit does NOT require the use of a spring compressor). 2018 JEEP RUBICON JL OEM FRONT AND REAR SHOCKS, SPRINGS, AND TOW HOOK AS PICTURED. REMOVED FROM NEW JEEP. DIRECT SIGNATURE REQUIRED. 9550 VSS™ Steering Stabilizer by TeraFlex®. Lift your Jeep. But don't expect an unmodified Jeep to go over every rock and tree stump you see. Don't expect it to be able to hillclimb in mud or slog through deep, loose sand. Steering stabilizers are designed to restrain "bump steering" and front end vibration, giving added life to tires, ball joints, and other steering components. This kit features Rough Country's NEW N3 series stabilizer cylinders and includes all brackets and hardware. 12 point head. 3-1/2" length. • Includes all 4 shock mounting bolts. 2007-2017 for Jeep Wrangler JK 2 Door. 2007-2017 for Jeep Wrangler Unlimited JK 4 Door. 2x Big bore steering stabilizer cylinders (1 3/8" bore). Stabilizer cylinder end mounts may vary depending on make and model of application. (4) Premium N3 Series shocks. Transfer case drop kit. Solid tubular transfer case drop maintains proper driveshaft angles to avoid vibrations. Extended sway-bar links. Front and rear lifted coil springs. Wrangler standard non tilt column with key. Anything that is non-working is replaced or repaired. DeadJeep is your first and only stop for rebuilding or repairing your Jeep. We provide the best hospice care until the Jeep moves on. Jeep Wrangler 87-95 factory OEM used power steering box. Does not leak or has play. Was never adjusted. DeadJeep is your first and only stop for rebuilding or repairing your Jeep. We provide the best hospice care until the Jeep moves on. 07 - 16 Jeep Wrangler. JEEP WRANGLER 2007 - 2016 All Models. New Set of (2) Rear Driver and Passenger Shock Absorbers. Fits Both Rear Driver and Passenger Sides. 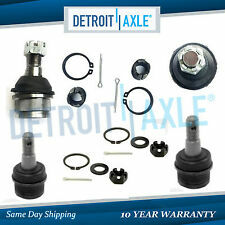 2x Complete Rear Driver / Passenger Shock Absorber Assembly - 437287. Wrangler power steering reservoir bottle. Great shape. This will fit all 4cyl Wranglers 97-06. DeadJeep is your first and only stop for rebuilding or repairing your Jeep. We provide the best hospice care until the Jeep moves on. Jeeperz Creeperz is an authorized distributor of this product. Ensure your front or rear sway bar's geometry is accurate with the Front Or Rear Adjustable Swaybar End Link Kit. Designed for use with 3 to 6 inches of suspension lift in the front or 0 to 6 inches of lift in the rear, these links will prevent unwanted axle housing contact and ensure proper handling on and off road. Each link is adjustable to allow you to tune in perfectly for your Wrangler's specific lift to provide superior balance and handling. Fits: Jeep Wrangler JK 2007-2018 with 2.5 - 5" of Suspension Lift. Quick Disconnect Front Sway Bar End Links. Model: Wrangler. 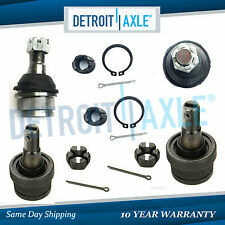 Kit includes one pair of front adjustable sway bar end links with ball joint style disconnects. Easy to install. No drilling required. Need More Jeep Parts ?. Bullet2 Easy to install. Bullet5 Limited 5 Year Warranty. Bullet4 Direct Fit. 1997-2005 JEEP WRANGLER LJ 4WD. 1997-2005 JEEP WRANGLER TJ 4WD. Adjustable: Accommodates 0"-6" of Vehicle Lift. Heavy Duty Carbon Steel Tubular Design for Stability & Strength. Self-Lubricating Bushings. 2007-2018 Jeep Wrangler JK. 2007-2018 Jeep Wrangler 2WD 4WD. This kit is engineered to replace your factory worn out tie rod and directly fit the new one, knuckle to knuckle, increasing leverage of larger tires and the 4WD system. 1993-1998 Jeep Grand Cherokee ZJ. 1997-2006 Jeep Wrangler TJ. 1984-2001 Jeep Cherokee XJ (FRONT ONLY). What to Expect: RIDETRENDZ JEEP WRANGLER LIFTING AND LEVELING KIT ! FRONT 2" Polyurethane lift Coil Spring Spacers ! REAR 2" Polyurethane lift Coil Spring Spacers ! 2007-2018 JEEP WRANGLER. These are for the 4wd & 2wd suspension . Power steering gearbox from a TJ Wrangler. Super nice shape. DeadJeep is your first and only stop for rebuilding or repairing your Jeep. We provide the best hospice care until the Jeep moves on. This will fit all Wranglers 97-02 and is OEM. Two (2) M14 Grade 8 Flat Washers Zinc. Compatible with Jeep Wrangler JK model years 2007-2015. Kit contains high strength Grade 8 hardware. Includes hardened extra thick washers (2 per bolt) that will not deform like standard washers and hex locking nuts. Jeep Wrangler 2007-2017 JK. Extended sway bar end links are designed to correct the angle of the sway bar once your vehicle has been lifted. They are manufactured from high-quality materials and use durable polyurethane bushings for maximum performance and durability. Crown: RT21012 UPC: 849603009214. Fits: Jeep Wrangler YJ 1987-1995. Fits: Jeep Wrangler (YJ) (1987-1995) w/ LHD; w/ Power Steering; w/ 4" or Higher Lift. Drop Pitman Arm. Each arm is designed to bolt in place of the factory piece with no interference issues. Extra heavy-duty replacement for OEM fixed length panhard rod. Variable length design helps prevent unwanted stress. Utilizes OE bends for correct geometry and clearance. Not compatible with right hand drive vehicles! . 07-16 Jeep Wrangler JK 4WD Gas. 07-16 Jeep Wrangler JK RHD 4WD Gas. With 3" of lift, you can clear those 35's with room to twist as well as use your Jeep for a daily driver. New Zone front and rear shocks are included that are valved specifically for your JK. 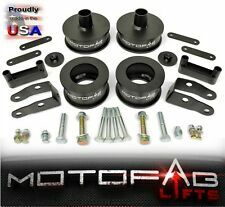 3" Front Rear Lift Leveling Kit 2007-18 for Jeep Wrangler JK Shock Extenders. Front and Rear Lift Spacers, inlcuding Shock Mount Extenders. for Jeep Wrangler JK 2007-2018 2WD 4WD. Lift Height: 3"Front 3" Rear. To do this, we design our systems to limit excessive wear and tear on factory ball-joints, steering components and reduce noise and vibrations. Find out why more people prefer a quality Trail Master Suspension, than other suspension kits on the market. 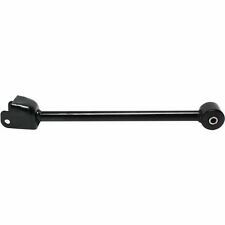 Rough Country Drop Pitman Arm for 2.5-6" Lifts - 97-06 Jeep Wrangler TJ 4WD. Fits 2007 to 2016 Wrangler, Rubicon and Unlimited. The ES2000 steering stabilizer is specifically engineered to improve handling characteristics and to reduce wheel vibration, which leads to suspension component fatigue and failure. The Jeep Wrangler was built for multi-purpose use. In addition to drives across paved highways, it is also designed for off-road travels. In turn, the Wrangler requires a stronger and more flexible steering and suspension system. Why would steering and suspension need to be replaced? In some instances, Jeep Wrangler owners simply want to upgrade the steering and suspension packages that originally came with their vehicles. They want a track bar, which handles rough country or spacers to install larger wheels with better traction. On the other hand, drivers may reach a bad patch of rough terrain and damage the control arms or suspension systems. When this happens, the Jeep is practically undrivable until those items are replaced. What parts experience the most wear and tear? When purchasing a Wrangler for off-road travel, drivers should be aware of the parts that may need replacement more frequently than their oil or interior lights. Suspension Systems: this includes the shocks and struts, which maintain stability in the harshest terrain. 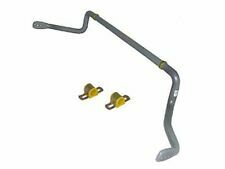 Control Arms: these connect the vehicle's front suspension to its frame. Coil Springs: these support the vehicle's weight and allow it to remain stable by releasing stored energy. Axles: these rotate the wheels while on the road. Track Bars: these control the left to right offset of the Jeep's axles. Are these parts easy to install? This depends on the owner. There are Jeep owners who have learned to replace coil springs to avoid additional labor fees or time in the shop. However, new owners who have never replaced a control arm or spacers should work with a licensed mechanic to start. This allows them to see the process and the required tools. What do owners look for if driving off-road? Look for items that are exclusively designed for Wranglers and rough-road driving. These parts need to be flexible in all suspension and control elements so that they can handle the strain when going far off the road. Make sure to have good-quality shocks as these are essential elements for off-roading. What are the signs these parts are broken? Besides the loss of control over the vehicle, there are other signs these parts are going bad. Axles: clicking or grinding noises when turning. Suspension: wear on the Jeep's tires and a rougher ride even on paved roads. Track Bars: an increase in vibrations. When these go, much of the vehicle's control goes as well.